5. are exposed to a whole new set of social environment and social situation that forces them to navigate and adapt to the world changing around them. But it’s not just a desire to be sophisticated socially that brings about this new interest in the social arts. Behind this increasing trend is also a desire to move fluently between different cultures and soft diplomacy skills. For instance, learning traditional finishing-school topics like interacting in social environments and hosting tips, how to pronounce luxury brands and foreign words correctly, the amount of personal space that is required when relating with western business associates, or how to shake hands and use western cutlery to eat. These are all aspects of social etiquette of the 21st century which I have coded in my workshops into A(pperance), B(ehaviour), C(ommunication), D(ressing) and E(ating). It is good to note that this isn’t just about aspiring to snobbery. Nouveau-riche generations from the emerging markets have fresh opportunities for global travel, but they are faced with the challenges of carrying out business overseas and other cultural or social issues. In the world’s fastest-growing economies, a family can move within a very short generation into a new league of social interaction and face new situations which they have no previous knowledge about. There is obviously no one to turn to for advice within their own family, circle of acquaintances or even in the educational sector – that’s where we etiquette experts come in. Another example of a situation where social etiquette is required is Nation Branding, which is based around public awareness on how natives of a country are often perceived overseas. For instance, at the Beijing Olympics in 2007 there was an official awareness campaign launched to enhance the city’s manners and eliminate habits such as queue-jumping and spitting. In 2013, “StarHub” launched a year-long campaign to spread Smiles and Happiness all over Singapore. A “Happy Bus” was roaming the streets of Singapore to deliver ‘random acts of kindness” all over the island. It’s only when behavior is brought to a new global stage that is when most people become self-conscious about them. Though it may be interesting to impress others with your sophistication and social graces, there are often very practical reasons to learn how to relate in a variety of different situations. A general desire to avoid being embarrassed or a behaviour indicating a sign of “incomplete” education, and to be confident in a new social situation is a huge motivating factor for students/clients signing up for social or business etiquette classes. Even for Asia’s wealthy and elites, they are starting to becoming aware that their social skills could be crucial for the success of a great business deal, or achieving the social coup of getting their child into a top English school or university beside their academic achievements, namely “fitting” in when necessary and knowing the “Rules of Society” . 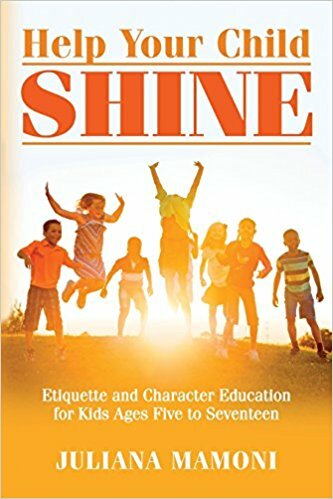 There’s also a growing trend of Asian parents making sure that their children have the required skill (see my latest book “Help Your Child Shine”) to handle other social interactions such as dining etiquette, so they won’t experience culture shock when studying overseas or having the upper hand when competing against a similar candidate at an interview for admission. This and more are learnt in my Youth Etiquette Courses. The curriculum entails topics such as how to go to an interview or how to give a first impressive introduction. This kind of upbringing is very important as it may help the children in the future to be accepted into the right international boarding school or overseas university. Juliana Mamoni, ‘mompreuneur’, Founder and Director of the Lifestyle & Etiquette Institute, is a globally recognised Lifestyle expert, known by many as "The Life Guru". She is a BA graduate in Economics with a further degree in Hotel Management (Berlin), a diploma in Men's Fashion Design (Milan), coached by an assistant to the acclaimed late designer Gianni Versace. She holds workshops and instructional meetings addressing Business, Social and Youth Etiquette. Her aim is simple: to help people make healthier, more socially appropriate choices, resulting in happier, more rewarding lives. Following her motto Look Good, Act Good, Feel Good, she offers guidance on diet, personal style and contemporary etiquette (mastering soft skills and emotional intelligence). She focuses on the etiquette element of her three-pronged lifestyle manifesto. Also Author of “The 10 Power Soft Skills for Success”, “Contemporary Business Etiquette for Success at Work", “Help Your Child Shine”. Also Author of her latest book "Help Your Child Shine"